I can change the PWM of the fan 0 but when i ask him to stop : M106 S0 , the led on the DUET stay On and the fan don't stop. I've try to put the fan on the fan1 output and everything is just working fine.. i can start and stop the fan with M106 P1 S0-255 and i can see the led on the DUEt going on or off. Nothing change when i remove the lines... i can not stop the fan but i can change the speed. When you use increasing S values in the M106 command such as S0.1, S0.2, S0.3 and so on up to S1.0, what is the effect on the fan speed? EDIT: you said in your post you are using M106 P1 S0-255 to control the fan. The P1 parameter specifies the FAN1 output instead of FAN0. So I deduce that you have your fan connected to the FAN1 connector instead of the FAN0 connector. Edited 1 time(s). Last edit at 02/19/2016 02:25PM by dc42. I will try s0.1, s0.2 s0.3. EDIT : just tried the M106 S0.1 S0.2 ,etc... with this command, i can change the fan speed as i do with M106 S0-255. Result is the same , I can't stop the fan. Edited 2 time(s). Last edit at 02/19/2016 02:38PM by Cammi. 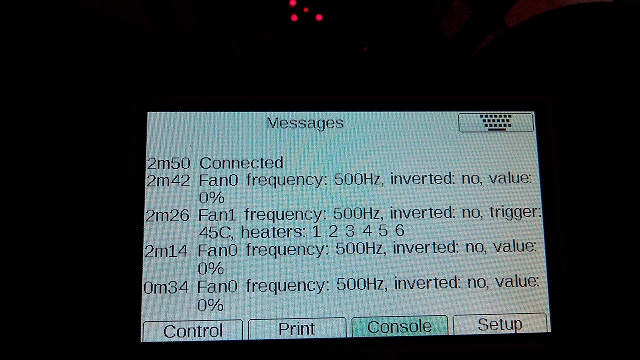 In 1.09r, FAN1 is configured as a thermostatic hot end fan by default. Send M106 P1 H-1 to disable thermostatic mode. Are you by any chance using a 4-wire PWM fan, and using the FAN0 output to control the PWM line? If so, the reason is that PWM fans are only controllable down to about 30% off full speed. I published a schematic a while back to allow a PWM-controllable fan to be turned off completely, on the Ormerod forum. I have done all my test with a simple 2 wire 40 mm fan. That's very strange then. My delta has a 2-wire 40mm fan connected to FAN0, and it turns off if I send M106 S0 or even M106 S20. Then it needs M106 S80 or higher to restart it. Can you confirm that you have the fan connected directly to the FAN0 pins, and nothing else connected to those pins? Yes i can comfirn that i have only a 2 wire fan on Fan0. When i power on the board , the led near the fan0 pins is On and the fan start spining. I'm at work for now. Will do more test tomorow. Can you confirm that you are using firmware 1.09r-dc42 and that you have removed the M106 I1 command from config.g? Yes i confirm for the firmware and the config file. Very strange problem. Is it possible that this pins are defect? I don't think so because I can increase and decrease the speed. I guess it's possible that there is a fault on the board, but it seems unlikely to me. What happens when you use smaller and smaller S values, e.g. 0.1, 0.01, 0.001? Does the led get dimmer and dimmer but then return to full on when you use S0, or something else? If you send M106 S0 and then just M106, what does it report? i have try smaller increment with S . I can see the light brightness changing. M106 state after M106 S0 in attachement. Sorry, I have no broadband at present so I can't watch videos. On the video , we can just hear the fan increase /decrease and th led that is changing a little.